There's nothing surprising - or disappointing - about the contents of the BlackBerry Curve 9320 retail package. You get a microUSB data cable, a charger and a single-piece set of earphones. The continental A/C adapter features its USB port on the side rather than on the top, and there's also a UK standard plug as well. There's also a 2GB microSD memory card (inserted in your phone) and the usual bunch of papers. The BlackBerry Curve 9320 stands at 109 x 60 x 12.7 mm and weighs in at 103 grams - almost the same size and weight as the Curve 9360 - although that model was only 11 mm thick. The phone is pleasingly compact and friendly, with no excessive decoration to distract from its functionality. The all-plastic construction of the Curve 9320 is characteristic of the Curve family. It is shaped to fit in one hand easily, and the keys are amply distanced from one another to allow quick typing with one or both hands. We took issue with the glossy back panel, which is prone to fingerprints, and may get slippery enough to fall out of your hand if you're not careful. We can see the back panel getting scratched in no time without a cover of some sort and it doesn't seem to fit well - there's a tangible wobble and occasional creaks. What would a BlackBerry be if not for the full QWERTY keyboard? Wellâ€¦probably a Curve 9380, but despite the few exceptions, the messenger form factor is still a BlackBerry trademark. In the Curve 9320, the keypad is optimized for quick and easy typing. The keys are separated by a small amount of space, but are set sufficiently apart to prevent accidental presses. The firmness and resistance of the keys finds that delicate balance which doesn't go too far in either direction - you can tell RIM have been doing this for a while. With a four-row keypad the numbers had to be accommodated over some of the letters - the numpad is on the left. You will also have to use a two-key combo for all the punctuation. Wherever the context allows it, the switch between numbers and letters is automatic. Many of the keys (not just the numbers) can be assigned speed dial shortcuts. There is a dedicated currency symbol key which doubles as a toggle between the loudspeaker and the earpiece. This toggle also works in the music player, and you can skip tracks back and forth by pressing P or N (previous/next). The optical trackpad sits between the display and the keyboard of the BlackBerry Curve 9320. It is adequately responsive by default, but has individual settings to adjust horizontal and vertical sensitivity, and even an option to play sound while using. It can also be pressed whenever you want to make a selection. The typical Menu and Back keys and the two call buttons are placed around it. All five of these top buttons have the same solid stroke and press feedback as the QWERTY keyboard, although unlike the keypad keys they barely stick above the surface of the phone itself. 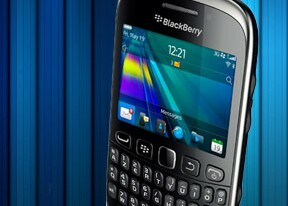 The navigation and call buttons are a lot more comfortable to use than the flat keys of the Curve 9360. Above the display we find the earpiece and the status LED. The left side of the Curve 9320 features the microUSB port for charging and sync, as well as one of the convenience keys. On the right are the other convenience key and volume rocker. By default the convenience key is set to launch the camera and serve as a dedicated shutter key. Portrait is the default orientation for taking pictures with the BlackBerry Curve 9320, and a shutter key placed low on the side makes little sense. It's a fixed focus camera anyway, so the trackpad will do. A small dedicated pause/mute button is placed between the volume Up and Down keys. In the music player, you skip tracks by a long press of the volume keys. The top hosts the Lock key and the 3.5mm audio jack. On the bottom there's the speaker grille and microphone pinhole. The back of the BlackBerry Curve 9320 features the 3 megapixel camera lens accompanied by the single LED flash. The lens is well recessed and reasonably protected against scratches. Removing the battery cover reveals the hot-swappable microSD card slot and the 1450 mAh Li-Ion battery. The SIM card slot is located underneath the battery. The back cover of the Curve 9320 is a rather thin piece of plastic that bends unpleasantly when pressed. The battery underneath is the respectable 1450 mAh and is rated at over 430 hours of standby and up to 7 hours of talk time. We can't help the thought that RIM is being too cautious after numerous complaints with the battery life of the Curve 9360 and its 1000 mAh unit. The Curve can be reasonably expected to do way better, considering the larger battery and lower resolution screen. 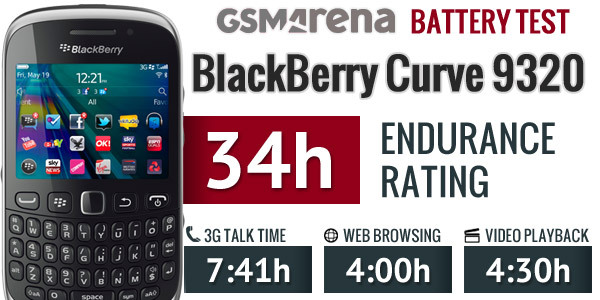 We ran the BlackBerry Curve 9320 through our dedicated battery test and found it to have a good, but not great endurance rating of 34h. Web browsing and video playback numbers aren't that great, but the 9320 met and exceeded the rated 7 hours of talk time. You can find more information on our battery testing routines over here.